We are a small five bedroom guest house. We aim to cater for the needs of all our guests. The following statement is a summary of our provision. If you have any questions relating to this or any other matters please feel free to call us and we will endeavor to help. The railway station is 15 minutes walk away or it has taxis outside the building. Taxis are also available from the town centre. Our nearest bus stop is only 100 yards away. It is for local & Coastliner buses. Parking outside our property is on street with either a disc or scratch card both we can provide. There is a dedicated disabled parking bay in the next street about 50 yards away. We are on a slight hill. We can assist guests with their luggage. There are 5 steps to the front porch door over a 3mtr distance, they are 17cm high and 1.2mtrs wide, with hand rails on either side. The bell to get our attention is on the porch door frame. The door is closed on a night in bad weather, but is never locked. The porch itself has one step in and is 1.7mtrs x 1mtr wide. Another 2 steps of 10cm high takes you in front door (84cm wide). This door is locked at all times but guests have a key for 24 hour access. 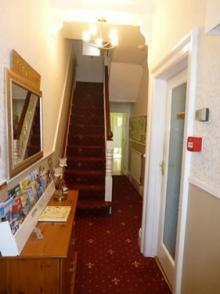 The hallway is fully carpeted with a reception desk as you enter. From here we have 11 steps then 2 more straight forward for room 2, or a flat turn then 4 more to a small hall leading off this is room 3 and 4, around again and another 12 more steps smaller landing and room 5. Through doorway and 3 more steps to landing and room 6. All steps are 20cm high and 80cm wide. There are handrails on both sides of steps. From the hallway we have a fire door under the stairs that leads down to a lower ground floor via 10 steps through another fire door with a very small step into our games room. This is fully carpeted; it has a low ceiling of 1.83mtrs. Ideal for kids as it has table tennis, pool table, computer and board games. Chairs round the edge and a table for drawing on. The dining rooms are on the ground floor. The main one has a laminate floor a breakfast bar, table and chairs that can be moved around for couples or groups of people. This area can be use by guests if they bring in their own food (takeaways) rather than eat in their rooms. Through a doorway down a step 15cm deep we have another dining room again with tables and chairs and a carpeted floor. We have a list of restaurants in our guest folders in the bedroom. Takeaways are on North Marine road 5mins walk away and we have cafes at both the top & bottom of our road. The pub (the North Riding) and the indoor bowls centre both across the road do meals & you can have a drink with them. Laundry: Not available on premises but a launderette is about 5min walk away on North Marine Road. Shops: We have 2 corner shops one at the top of our road one at the bottom. Leisure Facilities: We are about 10 min walk from indoor swimming pool at Ryndle Crescent. Outdoor Facilities: Indoor bowls centre, crazy golf, cinema, peasholm park and the sea(north bay) within 5 min walking distance. There is central heating throughout the house. The temperature of each bedroom is controlled by thermostatic valves on the radiators. All rooms have wardrobes, draws, bedside units, 22” flat screen DVD freeview TVs, alarm clock radio, tea/coffee facilities. Hair dryer, iron, ironing board, travel cot and small fridge for medication available. ROOM 1: Large family room, carpeted with a double bed and single bed. En-suite has shower, toilet and sink, lino floor covering. ROOM 2: Twin room with two single beds, fully carpeted. En-suite is large and has sink toilet and bath with over head shower. Lino floor covering. ROOM 3: Large double with king size bed, fully carpeted. En-suite has shower toilet and sink, lino flooring. ROOM 4: Large family room with addition of its own kitchen room. Double bed with bunk (single on top sofa underneath that pulls out to make another double bed) fully carpeted. En-suite shower, toilet and sink, lino flooring. The kitchen area is through a door it has a table, chairs, cooker, microwave, fridge, sink, toaster, pots, pans and cutlery. A door in the corner leads you to a balcony area that's 78cm x 2mtrs. It has a step over from the room and iron railing enclosing it. ROOM 5: Has a king size bed with fitted carpets. The en-suite is large and has a sink, toilet and large walk-in shower enclosure, lino floor covering. ROOM 6: Has large double bed, all new furniture, carpets curtains etc. 24” flat screen DVD freeview TV. This is an en-suite that has its own separate bathroom with toilet, sink and shower. 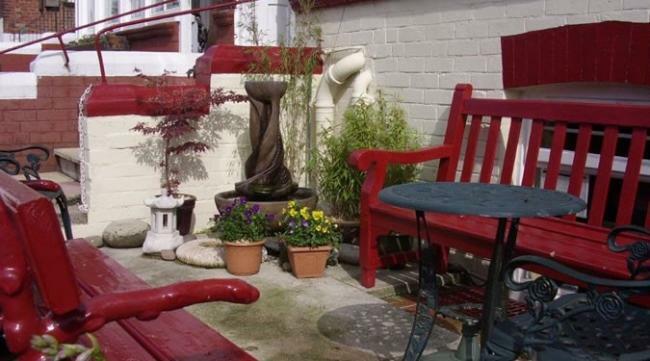 We have a 2.5mtr x 5mtr concrete garden area at the front of the house, potted plants and water feature, table and chairs make it a nice place to sit. Being 100% no smoking this area is handy for them (ash tray provided). Dogs and children are welcome at the Meltham. Free WiFi internet access is available throughout the guesthouse. There are fire extinguishers on all landings and one in room 4's kitchen. Evacuation should be via the front door. If you require more assistance for evacuating please notify us on arrival and we will ensure you are evacuated safely in an emergency (eg. hearing impairment). There are emergency lights on all corridors. There are folders in all bedrooms which gives you tourist information about the area. Please advise us of allergen or dietary needs before arrival so we can be prepared. If you require further details or have any comments about our services we provide do not hesitate to contact us.